Peel skin from yams and slice into 1/2 to 3/4 inch thick circles,place them in a pot add water and cook for 8 min. Pour half water off cooked potato keeping them in pot add sugar,butter, lemon juice, nutmeg. return to boil cover pot and reduce heat to simmer. 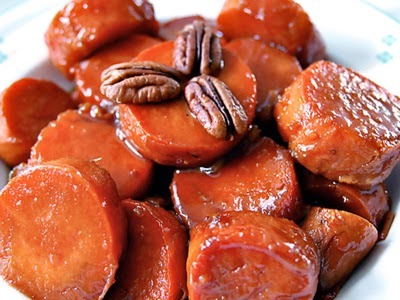 cook yams for 35 minutes or until tender and candied.